Happy Monday! Today I am thrilled to be collaborating with 26 amazing bloggers, to bring you a $500 Neiman Marcus gift card giveaway! Yes, you read that right. 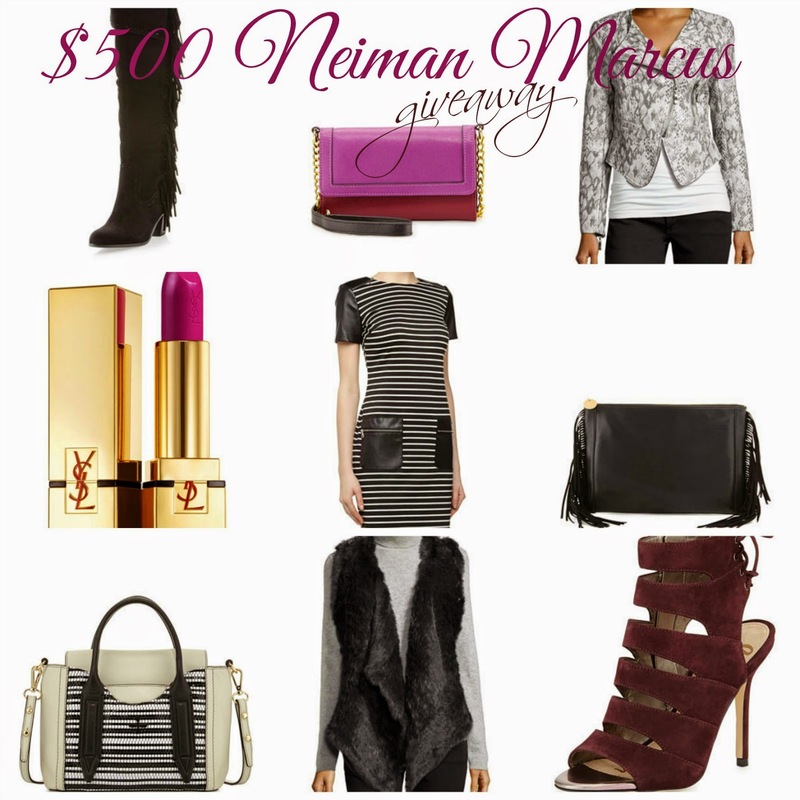 One lucky reader will win a $500 Neiman Marcus Gift Card to splurge on some amazing clothing, jewelry, and accessories. I don’t know about you, but I could spend hours on their site picking out adorable shoes, tops, bags, you name it! Oh, and to get you a little more excited, I chose a few of my favorites and linked them below. I only had 20 minutes to choose, but I could have shopped all day long! Here are a few I liked just quickly browsing. Last Call is also offering 30% off women’s apparel, shoes & accessories. Enjoy! What an awesome giveaway! Also I love your blog, I'll definitely be back! I would buy a much needed handbag or boots with the gift card! Thanks for the chance!! I would buy boots or a skirt or a blouse. Thanks for doing this giveaway even though I don't have a Twitter or bloglovin can I still enter? I'll get a suit for work. What a great giveaway. I must admit, I'd probably splurge on some new jewelry! I would buy a new handbag, probably one of those Rebecca Minkoff Handbags and then whatever is left over put towards some new shoes! I would loveeee a new bag!! Every year I attempt to purchase Christmas gifts for my nieces…each year I'm behind, so to speak. My 15/12 year old nieces Rhiannon/Thalia are fashion conscious…clothes/makeup/boys….would be a great prize to complete my shopping early. Fantastic giveaway. I would love to have some new clothes for autumn. At the top of my Neiman Marcus wishlist are the Helmut Lang Sonar Wool Cropped Jacket and the L'Agence Reverse-Seam Knit Sweater. I would buy myself some boots and a sweater. I would spend the rest on my mom.